I remember a couple years ago, when Porcelain Raft's music started making the rounds on mp3 blogs, thinking that the music he made was very pretty. That, above all other adjectives, was the key: pretty. There were other words that could be used, and most of his songs had interesting things going on beneath the surface, either structurally or melodically, but they were all pretty. I even marked one particular song of his as being quite good, one that I legitimately enjoyed and would gladly listen to on a fairly regular basis. I could never remember, though, which of his songs that was: this twinkling, sighing song with the big acoustic strums powering it? That other wistful, swooning song with different echo-y drums? There weren't that many of his songs out there, but zeroing in on the one I liked proved surprisingly difficult. It wasn't so much that his songs all sounded the same; rather, the method of delivery rendered songs that were quite different in a homogeneous style that failed to allow differences to register beneath the gloss of prettiness. The kind of sighing, wistful melodies favoured by dream pop (and by Porcelain Raft in his dream pop) don't take much persuading to slide over into anodyne, anonymous pleasantries, and Porcelain Raft's melodies seemed to have taken that as their starting point. Blame nostalgia and thick coats of reverb over everything, blame computer speakers and low fidelity sound files, blame the burden of good and tasteful influences, but Porcelain Raft could never really make an impression on me. His music was pretty, the analogous adjective to describing a person as "nice." Fast-forward a few years to January of this year and Porcelain Raft's first album (after a number of EPs), Strange Weekend, comes out. Curious to see if an artist who seemed to have some real potential--if he could ever get over the hump of "prettiness"--had capitalized on that potential, I decided to give Mauro Remiddi's music another chance. At ten songs in thirty four minutes, Strange Weekend is not a taxing listen. As with previous Porcelain Raft releases, there are some genuinely striking moments, though, worryingly, things haven't got any less "pretty." The loop that underpins "Is It Too Deep For You?" nods toward hip-hop and witch house before the song opens out into a windswept vista in the bridge, one of the few overtly pretty moments that doesn't feel forced. "Unless You Speak From the Heart" is a classic pop song seemingly made for lazy summer days that shows off Remiddi's strengths as an arranger, every sound placed for maximum impact. Strongest of all is opener "Drifting In and Out." Probably the best song I've heard from him, its forceful drums and zipping synth lines provide a propulsive thrust behind Remiddi's featherlight, androgynous falsetto. The guitar line that comes in at the end of the song is a particularly nice touch, shifting the entire song through a relatively small addition. Unfortunately, that guitar line is also the first hint of what for me becomes a disappointing trend. Though Porcelain Raft presents all the signifiers of dream pop, spiced up with some bedroom pop and chillwave flourishes that place him firmly within contemporary indie, the omnipresent prettiness (seriously, would a sharp edge in a song kill him?) and its attendant anonymity connect much of Strange Weekend in my mind to second tier Britpop and alternative bands of the late nineties who exchanged personality for generic, swirling production flourishes. 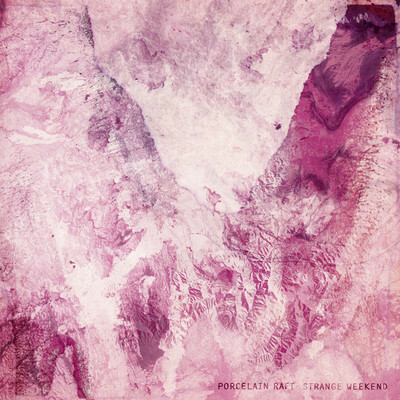 The beats, acoustic strums, vague electronic adornments, and whispering falsetto vocals formula--one that is supposed to signal intimacy, sincerity, and emotional immediacy--was already cliche before Porcelain Raft existed as a project, and here there's a very real sense of a cliche being deployed in an extremely literal-minded way. All of this is amplified on Remiddi's ballads, which predominate. Much of the middle section of Strange Weekend is devoted to power ballads, essentially ("Backwords" and "The End of Silence" being the worst offenders), and "Pictures," while impressive in one sense as it approaches a kind of platonic ideal of a dreamy ballad, is not a song I can ever imagine wanting to listen to: nothing is out of place, everything sounds perfect, and the whole song ends up going by without making any impact on me whatsoever. [W]e listen to raw visceral noise when we want to, and swoony pleasantries two hours later, when the mood has changed. But vitality and new ideas can fit into either one of them. And those are things worth demanding even from our "comfortable" listening. It's not like being challenging is incompatible with being beautiful--as far as I can tell, the two tend to go hand in hand. There's a strong EP buried in Strange Weekend--take the four or five best songs and I'd say Remiddi is on the verge of really having something when he finally releases a full-length. For such a short album, though, too much of it is forgettable to allow it to have any chance of making an impact. Remiddi is clearly comfortable with a certain style and approach to music--and he may yet end up with something quite interesting by sticking with that approach and becoming ever more himself--but I can't imagine why you would reach for this over Remiddi's influences, or even over his contemporaries (Atlas Sound's Logos does much of what Strange Weekend wants to do, but with better songs and results, in my opinion). For Remiddi, I'd say it's time for a mood change, time for some vitality and new ideas. In an ever-rising tide of pleasant, pretty music, Porcelain Raft is drowning in its own anonymity.